Here in New York, we’re just a wee bit jealous of Richard Blais’ cloudless blue skies and pasta-filled Georgia home at the moment, but we appreciate that he’s still making the journey up this weekend to run the New York City Marathon. The Chew visited his relentlessly sunny Atlanta pad to check out how he was prepping for the marathon this year, and it didn’t involve any swimming through rivers, so we’re pretty sure the race will keep its competitors dry, in spite of Post-Sandy conditions. So how does Richard train? With Fartleks, Jazmin-led yoga, and broccoli-kale-carrot pesto. Uh, eliminate circuit running and we could totally handle training for a marathon! This will be the Top Chef: All Star’s second time around the course, having participated last year, and he’ll be running for The Alliance for a Healthier Generation. Check out The Chew’s clip of Richard training below. 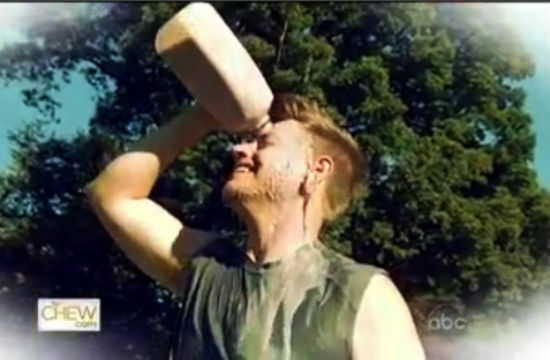 Bonus: his post-race reward is chocolate milk…poured over his face as a victory refresher.